Discussion in 'Electric Instruments' started by vchizzle, May 11, 2018. I'm going to give these a try. Looks like they've improved upon the design. Mike Duncan, claythomas and 11top like this. Cool. Let us know what you think. I used to use Schallers but got sick of the strap end not fitting on thicker straps. Did this new design fix that ? Looks like it. Twice the amount of room as the original. Looks like some really cool upgrades. I wonder how well they'll work w/the existing buttons. I'll probably try these at some point - maybe only replace the buttons on my primary guitars. Well crap... do you know how many guitars I have to replace these on now? I ordered one set. I have 2 straps that I use locks on and multiple guitars with just buttons. I'm gonna replace the full set on one guitar/strap, then see if there's much difference using old buttons vs. the new ones. I believe the button shape is the same, just that the new are steel one piece design rather than the separate button and screw. It's cool they seemed to address the issues that most people complained about. They sell just the replacement buttons separate as well. Will see how they fare, I should have them by Sunday. I've got a couple of sets of the older Schallers and they work fine. Strap thickness hasn't been an issue for me, but I think the lock wheels on this new design that can be hand-tightened are a real improvement over needing to use a wrench. Looking forward to what you find out. The pics make it hard to tell how much the new buttons are shaped like the previous button. The one-piece thing doesn't matter as much to me. If the new strap parts work on the old buttons, I'll likely replace a few on my straps. They're a huge improvement. I haven't had a strap I couldn't get the old design on, but it's much more of a chore on some straps, and since the nuts always seem to work loose, the shorter amount of travel led to a couple coming apart (no plummets!). The combination of the longer travel and the locking mechanisms make this a great improvement. Looks like a terrific improvment. I’ve seen a few Schaller (and other) locking strap button instruments become disconnected over the years when playing with other folks. I’m happy with the stock buttons, they work fine for me. But if I needed strap locks, these would be a good choice, I think. I was looking at the since the original designs make noise for me and don’t stay tight on thick leather straps. Ended up going with the Dunlop system though, and I think I’m going move my other guitars over to it. Still, it’s good they’re improving the design of these. Strap thickness hasn't been the issue for me, it's hole diameter. I end up having to cut bits out of all my straps to accommodate the Schallers. There are strap makers (the English company, Heistercamp comes to mind) who will make beautiful leather straps with any size hole you specify. I had one made for my son’s straplock guitars, and I had them make one with a longer buttonhole for my stock PRS buttons. I think Richter (in Germany) will do the same. Both companies do gorgeous work. These seem perfect for my R9/strap needs. Supposedly the screws fit the R9 hole without modification. I use a thick strap with the LP. And remember always “Protect your Love” - buy some for that special lady in your life! I'm not so into leather straps, tho. 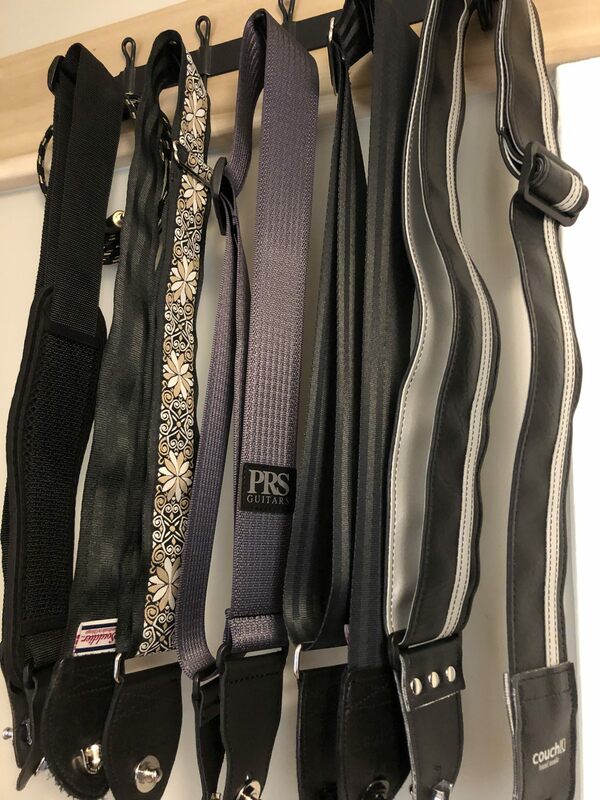 My collection is mostly darker seat belts from PRS, Couch, Souldier. Gotta mangle those leather ends myself. Mike Duncan and dogrocketp like this.